All these years later, we’ve landed in the middle of your teenage years. We’re learning to walk a tight rope between our parental input and your independence. It’s not easy for any of us. The wisdom that we’ve gained from years of living and your desire to make your own choices clash at times. And even when you dutifully (and sometimes sweetly) follow our directives, I know you don’t necessarily understand. ~ why I remind you to “be careful” nearly every time you get behind the wheel of the car. ~why I want you to text and let me know when you’re leaving the school to drive home after a late night ball game. ~why I said “no” to that sleepover, and the only excuse I had to give you was that it just didn’t feel right. ~why I probably drive you crazy with how often I ask if you’re okay. ~why I want to know where you’re going and who with…all the time. ~why I won’t let you watch that movie or listen to that song. ~why your cellphone has to be in a basket in the kitchen by 10pm. ~why we’ve taught you to budget and work a job instead of just handing you money. ~why I buy you books titled Liked: Whose Approval Are You Living For and send you blog posts about not settling for bad relationships and ask you to read them. ~why I pray for you so often (though I know I should be on my knees even more). When, if God wills it, you have a newborn of your own, you’ll begin to understand. When that cuddly baby becomes a toddler, then a kindergartener, you’ll get it even more. 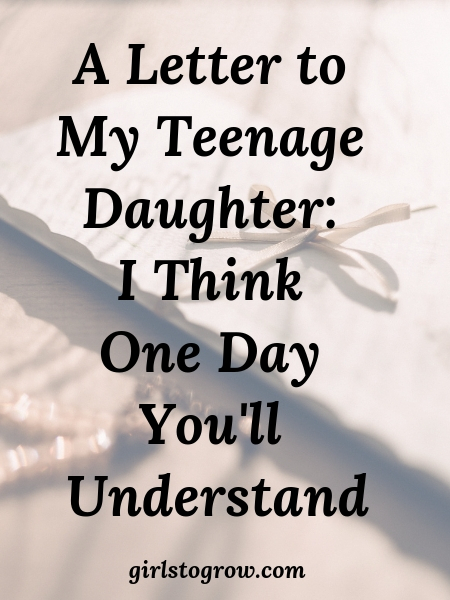 And when that 16-year-old, license in hand, heads out the door to drive all by herself for the first time, then, my sweet daughter, you will understand. As hard as it is to believe today, I see you doing many of the same things that right now you think you’ll never do as a mom. Because your heart will be like mine…overflowing with love for a nearly grown child whom you want desperately to protect from the hurts of life and the scars of sin. A child for whom you want only the best. And in the process of learning to let go, you, as I do, will find yourself leaning ever more on the God who ultimately has control and who loves that child more than you ever could. So thank you, in these days when you don’t understand, for being patient with your dad and I. We’re all together in this new stage of the growing-up journey. You’ll make mistakes, and so will we. But if we keep our relationships with God and with each other front and center, we’ll make this transition successfully. We’ll see you go on to become the amazing adult we know you can be. Then one day, my dear, I believe you’ll understand. Because you’ll see for yourself that all we did stemmed from a heart of love for the precious daughter you are. What a beautiful letter! Thank you for sharing it with us! What a sweet compliment, thank you!! Yes, it’s a tricky balance, but I believe that if our children know our hearts are for them, they’re a lot more likely to accept our limits and instructions, even when they don’t understand. Misty eyed, nodding in nonstop agreement!!! My sweet friend, I know you are right there behind me in this parenting journey!! Kids growing up so very fast! This letter is so beautiful. My babies aren’t teenagers yet, but I share so many of these same sentiments.